Nanjing University of Aeronautics and Astronautics(NUAA) enjoys a well-balanced development of multiple disciplines in natural sciences, humanities, social sciences, management, etc. with the characteristics of aeronautics, astronautics and civil aviation. NUAA is among the first batch of national key universities entitled to award doctoral degree, master’s degree and bachelor’s degree. 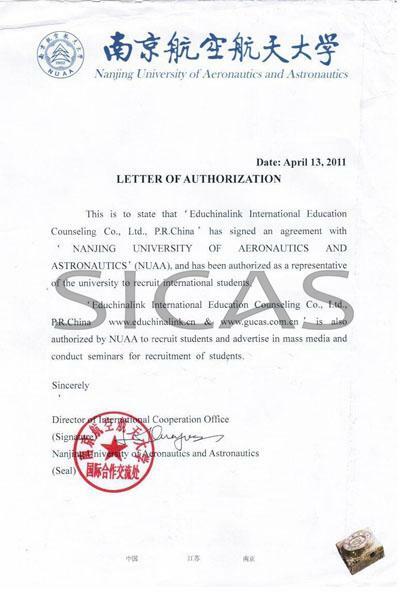 Nanjing University of Aeronautics and Astronautics (NUAA), established in 1952, took the 1st place in Chinese University of satisfaction list in 2006. It has the English-Medium Aeronautical Engineering, Mechanical Engineering, Software Engineering and Management and International Business courses for Bachelor’s Degree. Moreover, NUAA has maintained close ties with many prestigious universities, research institutions and enterprises of the world. After graduation, students from NUAA has always welcomed by the job market. NUAA will also make you competitive.